Step off the beaten path and head to Rockingham Beach and Binningup Beach. Your inner history buff will appreciate Fremantle Prison and St. Mary's Cathedral. You'll find plenty of places to visit near Perth: Harvey River Estate (in Harvey), Mullaloo Beach (in Mullaloo) and The Fremantle Round House (in Fremantle). There's lots more to do: stroll through City Beach, enjoy the sand and surf at Trigg Beach, let your taste buds guide you at a local gastronomic tour, and identify plant and animal life at Matilda Bay Reserve. For ratings, more things to do, where to stay, and other tourist information, use the Perth trip itinerary builder tool . Cape Town, South Africa to Perth is an approximately 18-hour flight. Traveling from Cape Town to Perth, you'll lose 6 hours due to the time zone difference. In August in Perth, expect temperatures between 22°C during the day and 9°C at night. Finish your sightseeing early on the 8th (Sat) so you can travel to Adelaide. Visit Martindale Hall Heritage Museum and St George's Anglican Church for their historical value. Eschew the tourist crowds and head to Gorge Wildlife Park and Henley Beach. 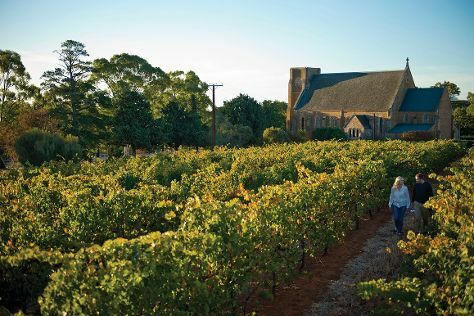 Get out of town with these interesting Adelaide side-trips: St Aloysius Church (in Sevenhill), Clare (Sevenhill Cellars & Crabtree Watervale Wines) and National Motor Museum (in Birdwood). There's still lots to do: enjoy the sand and surf at Aldinga Beach, don't miss a visit to Smith Brothers Walking Trail, cross one thing off your bucket list with a skydiving experience, and tour the pleasant surroundings at Glenelg Beach. For ratings, other places to visit, reviews, and tourist information, go to the Adelaide route builder website . Fly from Perth to Adelaide in 5.5 hours. Alternatively, you can take a train; or drive. The time zone difference when traveling from Perth to Adelaide is 1 hour. When traveling from Perth in August, plan for a bit cooler days and about the same nights in Adelaide: temperatures range from 18°C by day to 8°C at night. Wrap up your sightseeing on the 13th (Thu) early enough to travel back home.